green-initiative ecosystem for gallery signage. 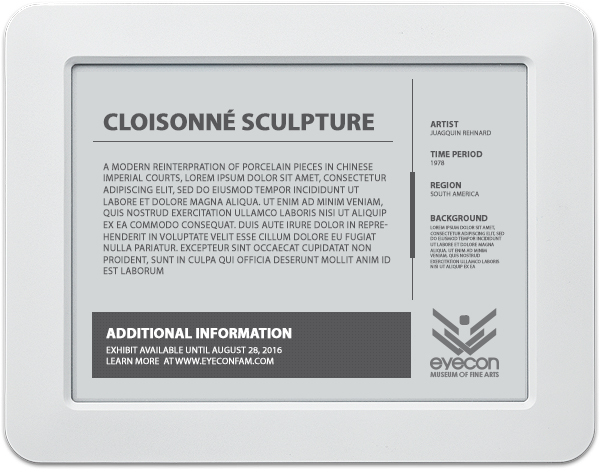 AMLABEL is a digital replacement to existing gallery paper display labels. AMLABEL’s screen adapts to the ambient light of it’s surroundings and displays a paper-like visibility, with a 180° viewing angle. The perfect green solution: the screen performs at less than 1% power consumption compared to traditional LCD screens. Reduced power consumption, and energy efficient technology enables AMLABEL to function for months without requiring a recharge. AMLABEL is fully operational in mere minutes after unboxing, saving your facility’s staff hours of time spent on installation. AMLABEL’s easy-stick magnet eliminates the need for drilling, leveling, and cleaning after mounting.